Welcome back C64 and 6502 Fans. This week I've got a special post for you. While I normally stick to nerdy technical topics like, programming theory and analyzing how the C64's KERNAL works, I do occasionally like to branch out and do an editorial, or review various hardware and projects. And there is a picture of the full–color, glossy cover of issue #9 that has just shipped mid 2017. I was so excited when I learned of the active publication of a C64 related magazine nearly 20 years after my last issues of Commodore World arrived in my mailbox, that I got a subscription without hesitation. Read on to learn more about this great little project by Vinny Mainolfi. I feel an immediate kinship for this production, starting just with the fact that we both chose logo designs that own the 8-bit low-resolution look. My own C64 OS logo features a smooth Commodore Logo and a blocky blown-up C64 font "64 OS". FREEZE64 also went this route with a blocky blown-up font for "FREEZE" followed by a smooth "64", which I believe is styled the way it appeared on certain early models of the breadbin. I like it. Before we get into the review, if you're already sold, where can you find out more? FREEZE64 is a paper–based fanzine produced in the UK and shipped all over the world that focuses on C64 games, gaming, coding and cheats. What is a fanzine you may ask? Well, you can read the Wikipedia article to get a full description. But in short, a fanzine is a type of magazine that is not professionally produced, but is produced instead by fans of the subject matter. FREEZE64's subject matter includes features on great games from the past, as well as news about recently released games and games under development today, exclusively for—the best 8-bit machine in town—the Commodore 64. Along the way it explores random old games, wading through some duds in search of hidden gems. This fanzine also includes exclusive interviews with an impressive range of C64 game developers and gurus past and present. And last but not least, of course, each issue is crammed with cheat codes, pokes and other secrets from the vast treasure trove of Vinny's personal adventures in hacking. Here's a sample of one of his game hacking notebooks recently posted to twitter. In the lower left you can see a box full of previously filled hacking notebooks. He won't run out of material any time soon. Alongside the fanzine, FREEZE64 also produces these delightful little reference cards. One is included free with each issue. They are business card sized, beautifully produced, and feature a quick reference to pokes and cheat codes for the game featured on the issue's cover. I'll be honest, I'm not a huge gamer. My personal preference in software is productivity applications, utilities, tools and operating systems. I've owned various Nintendo game consoles over the years, but an original NES and SuperNES, and an original GameBoy are the only ones I've held onto. The other platforms failed to hold my interest, as the games were always too complicated and required too much investment in time. I always felt like they sucked up too much of my attention and drew it away from my real passion, which is using, exploring and programming my above–said preferred kind of software. Commodore gaming, on the other hand, has always held a very special place in my heart. From my earliest memories going all the way back into childhood, I have a long history of whiling away countless hours in my bedroom exploring boxes of 1541 floppies. A mixture of commercial titles and others with hen–scratched labels, loaded with cracked and pirated games that I acquired as hand-me-downs from people who were upgrading their life to a PC. (That never held much interest for me either.) You never knew what you would find on those disks. It was a mysterious place to plumb and explore, long before the internet was around. If I had to characterize C64 games I would say they are: charming, idiosyncratic, HARD, and relatively short,2 but bursting with novelty and creativity. One of the things that continually amazes me about the Commodore 64 is the sheer vastness of its software library. Much of which is made up of games and demos. 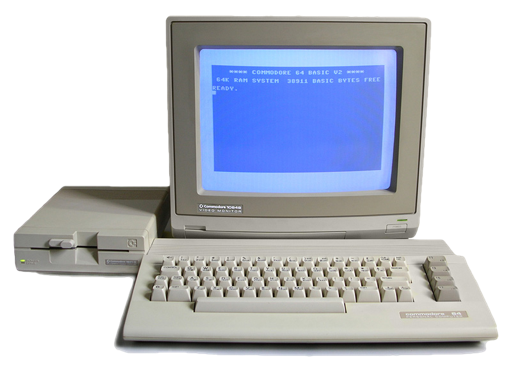 Even after being a Commodore user for literally my entire life—got a Vic-20 when I was five—I still feel as though I have barely scratched the surface of the games out there for Commodore users. Not only have I not played most of these games, I have never even heard of them. As someone who is interested in exploring what his C64 has to offer, what I need is something that will surface cool games. Bring the titles to my attention, so I can take note, look them up later and enjoy playing them. Well, that's exactly what FREEZE64 does. One of my first impressions was surprise about how small the form factor of this fanzine is. When you see pictures of the covers on the website, you don't see them in the context of anything else to judge how big it is. The website actually mentions that it's A5, but I don't usually deal with paper or printing so that didn't register as meaning anything to me. A5 is 5.83" x 8.27". Or roughly speaking, an 8.5"x11" sheet folded in half, for us North Americans. Take a look. This isn't a complaint, each issue is packed with content. The outside cover is printed in full–color on thick glossy paper. The gloss actually gives the cover a slightly grippy feel. The first issue I received, Issue #8, contains 32 pages, but that's gone up to 36 pages starting in Issue #9 that I just received. What that means is an additional A4 page, printed front and back and folded in half to contribute 4 additional A5 sized pages. The inside pages too are quite thick and have a slightly fibrous feel compared to commercial magazines you might be accustomed to. The whole thing is bound with two staples. Owing to the combination of smaller form factor and thicker than usual (for a magazine) pages, the overall product has a certain stiffness to it. You can't, for example, open it to a page and expect it to lie flat open on the desk. It has a tendency to want to stay in its folded semi–closed position. You can see what I'm talking about in the photo below, I had to use my fingers to hold it open to get a solid photo. On the plus side, I'm super pleased by the fact that this fanzine is printed in full color. To put this in perspective, for magazines from the past that were on a budget, such as GO64!, it was common for the majority of the inside pages to be black and white with only a few special full–color inserts. Almost like the plates in some, often older, print books used to show pictures. Commodore World in fact was all black and white, except the cover. So it's quite a treat to have full–color prints on every page. And that color is put to excellent use. Every page either has photos, screenshots or game cover art. As well as fun little extras such as blown up C64 sprites. I'm pretty sure that's the explorer from Maze of the Mummy on the page in the photo below. I also must say that the layout, style and color scheme used are very professional. Main article content flows in two columns which is the optimal layout for the page, and the titles use clever fonts. It's playful and fun, as you would expect from a publication about games. One advantage to its compact form factor and layout, is that it feels full. I don't mean busy or crammed. I mean it feels full. I understand why they have expanded to 36 pages from 32. But to understand why I bother to make this observation you have to know what late (mid '90s) Commodore magazines were like. (I'm lookin' at you Commodore World.) They were thin, in a way that made them feel as unhealthy as the business behind them actually was. When you're a full 8.5"x11" (or, A4) but you've only got 42 pages, the whole thing feels emaciated. Commodore World, at the end, felt like the steam had just run out. It was supposed to be a news magazine, but new issues only came intermittently and when they arrived they felt starved for content. In order to fill those 42 full–sized pages they had to fall back on some pretty demoralizing wastes of space in the layout. Take a look at these two tables of contents for an example of what I'm trying to express. In a FREEZE64 issue, on the left, the actual listing is composed of approximately 205 words. The Commodore World table of contents is just 67 words including the names of the article authors, and excluding the standard sidebar of credits and copyright. The FREEZE64 table of contents contains over 3 times the content, on a page that's half the size! N.B. All inside photos of FREEZE64 reproduced in this article are with the explicit permission from Vinny Mainolfi, and are for editorial purposes. Do yourself a favor, get a subscription! Not only does the list of contents in the Commodore World issue itself feel meagre, but the space on the page just doesn't feel fully utilized. It feels like half the page is nothing but vacant white space. You never get this feeling when you're reading FREEZE64. Again, FREEZE doesn't feel crammed or overly busy, it feels comfortably full, without any wasted space. The effect of this on the morale of the reader is dramatic. Bands (music groups) figured out this trick a long time ago. If they draw a crowd that fills a club, they play in a club. If they play in a stadium and 80% of the seats are empty, nobody's having fun and it damages their brand and their image. As you read FREEZE64, you get the feeling that this is a healthy product and its producer is alive and vibrant and passionate. Reading it is the opposite of demoralizing, it's invigorating. It makes you want to bust out your C64, brew some coffee and start testing out the hacks, staying up way too late on a night when you know you've gotta go to work the next morning. I've got a subscription, but until a couple of days ago I only had one issue in hand. There were some things in Issue #8 where I couldn't tell if they were special for that issue or if they would be recurring features. Now that I've got Issue #9 I can do a little cross comparison and say with more certainty what things seem to be standard. The first page, after the inside cover table of contents, is the welcome to the issue note from the editor. Including copyright notices, contact information, and a few words of summary about what adventures are to be found within. In addition to this welcome page within the content, each issue seems to come with an additional slip of A5 paper, as a thank you and welcome note to the reader. It gives us updates on how the project is going, reminders about competitions, special announcements and calls for contributions. Each issue typically has a game as its main cover feature. Some are new, some are classics. Games featured on the cover so far include: Monty on the run, Bruce Lee, Ghosts 'n Goblins, The Bear Essentials, Hunch Back, Master of the Astroids, Wizball and Maze of the Mummy. Maze of the Mummy was released in 2014, and The Bear Essentials was released in 2016. I'd say those are pretty new games. Hunch Back on the other hand, was released in 1983, Bruce Lee was released in 1984 and Monty on the Run in 1985. That's a 33 year spread. The C64 has certainly been around the block. The feature discusses the history of the game, the novelty of the game play, and all variety of interesting tidbits depending on the peculiarities of the game. Screen shots, in full color, are of course always included. But given its roots and association with Hackersoft and C64endings, there are two specialties of this fanzine: Cheats, codes, hacks and secrets, and Game Endings. Vinny Mainolfi seems to have a particular passion (or should I say obsession) with both of these things, hacking and cheating games, and then seeing the end sequence, documenting and rating it. Whether you're looking to learn about games you've never heard of before, or learn some history, tips and secrets about games you've played but didn't really know that much about, or you just want to reminisce about old favorites, FREEZE64 is for you. Out of the "Mouldy Cupboard"
This is a clever column that takes a quick peek at a totally random game that's obscure and that you've probably never heard of. Then discusses some of its salient qualities, and applauds it or gives it a thumbs down. The one thing you can say about this column is that you never know what you're going to find hanging about the mouldy cupboard. This is certainly part of the charm of this fanzine. It's not afraid to be funny and cheeky, and honest about itself and our beloved platform. No one is pretending the C64 is young. It's got some great classic games and it's got some new games. And it's had some really amazing talent and tremendous love poured into it over the decades. But at the same time, it has all these weird old corners. Nothing could be a more apt description than a mouldy cupboard. With Desert Island Disks we have another column with a clever spin. It's effectively an interview piece with someone famous from Commodore's past or present. But the gag is to have them pretend that they're going to be stranded on a desert island and have the option to bring with them various Commodore games, tools and peripherals. The interview asks them about their favorite joystick, favorite SID tune, top 5 games, their favorite Commodore magazine, their favourite uility, book and gadget, etc. It's a fun way to learn about some brilliant C64 gurus from the past. But it's also a great way to surface new games, utilities, tools, and services you may have never heard of before. I just learned about SLAY Radio. Who knew? Commodore World tried to be a News Magazine. The problem is that there just wasn't enough new stuff being developed to fill a whole magazine and still be able to publish every single month. FREEZE64 doesn't aim to be exclusively a news magazine, it aims to be a gaming, cheat fanzine that offers a variety of supporting features, which also includes news. What this means is that it can draw on a rich 35 year history for its content. Snippets of News is just that. It's two A5 pages that talk about cool new games that are being developed. It's a great place to learn about new games in development and see some early screenshots. But it doesn't stretch itself beyond what it can handle. It's playing in a club rather than a stadium. And that's the right thing to do in 2017. The fact that we still have new games being developed at all is a gift and a pleasure. I strongly encourage you to support the community and help keep the love pouring in for years to come. You can buy new C64 games from Psytronik and Protovision, as well as from independents like Pond Soft. This column is exactly what it says. It takes a game from the archives and completely spoils the ending for all of us who have slaved over the absurd difficulty of most games from the 80s and haven't yet beaten it for ourselves. Haha. I'm only half joking. If you're actually struggling to get through a game with hopes of gratifying yourself by finally getting to see how it ends then this column really will spoil it for you. But in practice, it's just a fun way to see cool C64 graphics and story concepts that—unless you're a superdedicated gaming guru master—you're likely never to see otherwise. Some games have pretty crappy endings, or no ending at all. Some are quirky and downright weird. But others have elaborate beautiful artwork. It's a shame that the number of people who typically got to see these endings—back before the internet—were a vanishingly small percentage of all those who got to see how the start of level one looked. If I had to choose, I think this might be my favorite column in FREEZE64. It is an exclusive interview with a famous coder. I don't know how exactly Vinny gets in contact with the people he interviews but it's pretty cool that he does. To give a sense of the specialty of this column let me quote from the Welcome Letter insert of Issue #9. "Also in this issue I have been lucky enough to interview one of my all-time C64 coding heros, Mr David Darling. From the moment I started buying, playing and collecting his games I've wanted to know more about him and his coding history, and it has finally happened. [...] Definitely a dream come true." I get the feeling that for Vinny this is a pretty special column too. In this column we get a very brief look at several games, where the focus is exclusively on pokes (precision changes to certain memory values that can be applied using a freezer cartridge), and codes, which are either in–game codes or more frequently places in memory to jump to get to later stages of the game, or to see the game's ending sequence. I mentioned on twitter that I need to get myself a freezer cartridge. Vinny reminded me that the pokes and codes can also be used in an emulator. True enough. If you are into C64 gaming via an emulator, these pokes and codes are readily useful. If you're on real hardware and you want to make best use of them, you really need some sort of freezer cart. I have an old (1985) Snapshot cartridge. It's so old that the push button is no longer pushable. I was a bit afraid to plug it in in case it damaged one of C64s. But I took the plunge this weekend. I cracked open the case to inspect the circuit board for any other visible damage and didn't find any. So I plugged it in, turned on the machine, but there was no change to the main Ready. screen at all. I was expecting something to be different. I used a pair of aligator clips on probe wires to build a makeshift push button. But when I connect them, the screen goes all blue. Unfortunately, my old snapshot cart seems to no longer be in working condition. Fortunately it didn't damage my 64. I've been searching Ebay for an Action Replay, Super Snapshot or Retro Replay cartridge. I read that Retro Replay is no longer being produced. However, to my delight, its successor Nordic Replay, which began as a DIY kit, is now being commercially produced. It is available for order today from Individual Computers for 59,94 € Get it while it's still available! Secret Squirrel Reveals All is a pretty zany column. It's dedicated to exposing secret messages and other tidbits embedded in the code of various games. Mostly a novelty, I think, but it does provide some interesting reading. It gives you a glimpse into the life of a serial game hacker. By perusing the code looking for human readable text the intrepid hacker can find secrets in the game that are not immediately obvious simply by playing it. From the knowledge of a secret's existence comes the impetus and the starting point for a more detailed search that could eventually makes its way to becoming a full blown entrant to Pokes 'n Codes. This column is very much like the New and Exclusive Pokes and Codes column, but it draws on the Hackersoft archives to get its material. I better get on ordering my Nordic Replay cart! This is a one-pager and almost exclusively composed of screenshots. It takes a cool game that fits the theme of the Issue and shows sample screen captures from each level, one after the next. It's like a miniature longplay shown in static images. Speaking of longplays, if you weren't aware, almost any C64 game of reasonable popularity can be found on youtube by searching for its name, C64, plus the word longplay. Like this, "sanxion C64 longplay". Here you can watch someone play a brutally difficult game from beginning to end. I bought a copy of Sanxion at a Commodore Expo just prior to my hiatus (in which I got married and had two kids.) I cracked out the disk a few weeks ago. It's a pretty fun game, the graphics are typically sweet for a game by Thalamus. But it shattered my mind how difficult it is to master. Watch this guy play with the almost perfect reflexes of a robot designed specifically to play this game. To be honest, it's not enough. Because several of these machines are in less than perfect operating condition. The inside backcover features a sneak peak at what to look forward to in the next issue. I can't speak highly enough about this humble little fanzine, so he calls it. It's a great production, the C64 community is blessed to have people who are so dedicated. Vinny deserves your patronage. It's highly affordable, just £3.75 plus shipping per issue. That's less than 5 bucks an issue, USD. But the proof is in the pudding. I can't keep my 5 year old son away from it. Here's the information once again about how you can find out more.